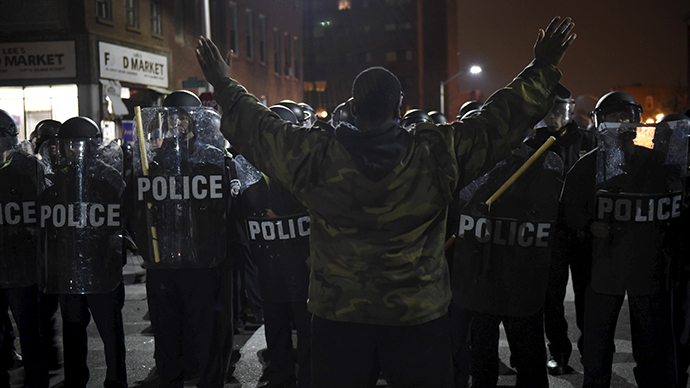 Baltimore police said it has credible information that street gangs have joined forces to attack police. The statement was issued minutes before the funeral service for Freddie Gray, who died in Baltimore police custody earlier this month. Nation of Islam activists said on Saturday they had brokered a “truce” between the long-time rivals Bloods and Crips, and posted a photo on social media showing the members of two gangs wearing their colors and posing together. However, a number of local residents, activists and observers have greeted the police announcement with skepticism, posting on social media that the timing of its release was “too convenient.” One Baltimore resident described the statement as “controlling the narrative”. I fully expect hard questions from @baltimoresun reporters on this. Even if true completely unnecessary and vile to release during funeral. BPD issuing PR during funeral is called "controlling the narrative" in my communications world. Funeral humanizing cause? Dehumanize! Gangs! I'm sorry, without specifics you need to see that this is a cynical attempt by the BPD to distract the media from Freddie Gray's funeral. Several thousand people gathered at Gray’s funeral, which began at 11:00am local time at Baltimore's New Shiloh Baptist Church.